Monday saw us loading the pigs and taking them on their final journey. The reality of their end is masked by some angst at this time. By this stage they are no longer cute piglets, but two hundred weight of young boar. And having boar weaners is a first for us, they matured at an alarming rate and we worried about the possibility of boar taint. So getting them booked in, then the stress of trying to persuade that much pig into the trailer.. then the unloading at the other end all adds up to angst. Actually they loaded easily, came out of the trailer easily, and didn’t miss their appointment…. Only after that do we miss them, and we do. But this is part of the deal. Today the pigs came home again, as pork, and we spent the day cutting them into edible portions. The meat is free of taint, and not too fatty at all, probably the best pork we have raised to date. We strayed from the basic cutting plan and cut the middles close to the eye of meat, leaving a bigger belly slab, which himself cut into belly slices, on the bone,for meaty rib eating. Meanwhile I boned out the loins/racks and cut the meat into many many steaks, and we cut a small joint from the side runners / hock and hands from under the spare ribs, which just seemed too lean and lovely to cut up for mincing. So now we have an abundance of pork steaks, roasting joints, tenderloin, trotters, ribs/belly slices, and mince. Totally shattering day, but rounded off nicely with a trip into town; we sat outside under the canopy of a riverside bistro, a small group turned up and started playing swing and with pint in hand and the rain teaming down on the canvas, it gave us that camping/festival feeling. …comes from enjoying the simple things. Such as sunshine and dry ground when I leave the house to check the animals. 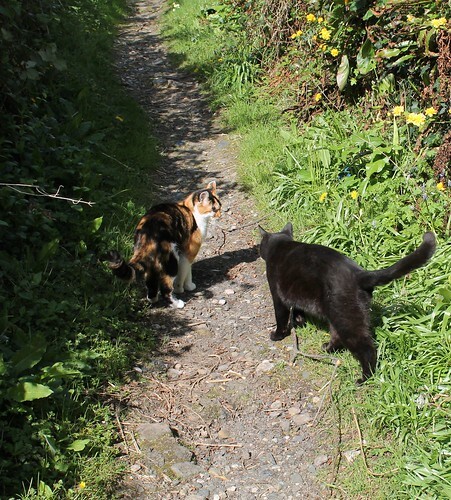 The cats like to keep me company, Molly because she follows me everywhere, Pete because he tries to herd me back to the house to open a tin. 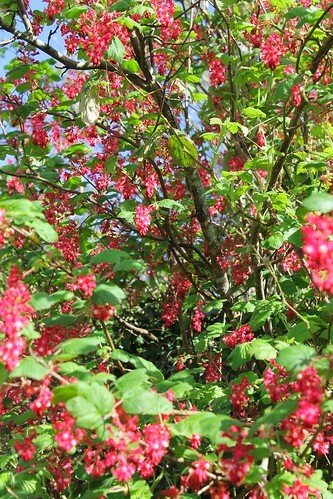 The red flowering currant that is tree like in proportions and leans over the lane, a surprise burst of colour to me everytime. Always heaving with bees. 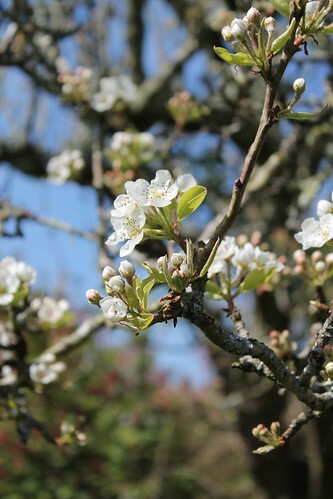 The pear blossom. The pears are fairly useless, and the tree crooked and beyond pruning back into shape, but the blossom every year makes it all worthwhile. 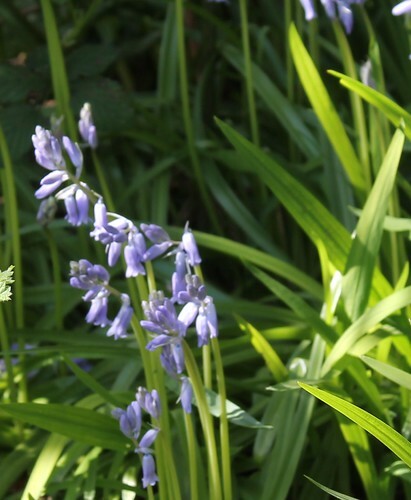 Bluebells in the lane, English ones too. I never tire of collecting eggs, still a pleasure. 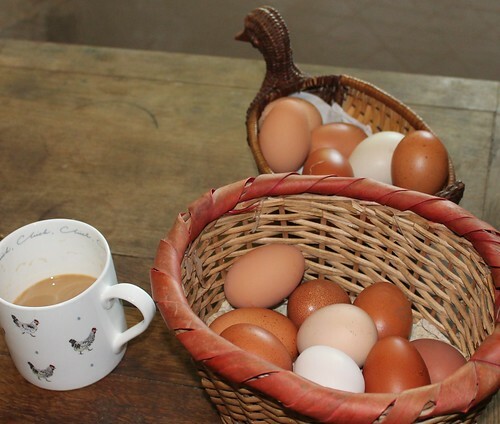 Then back to the house with my baskets, a break and a cup of coffee. It’s all go here at colouritgreen towers, chickens and ducks are laying eggs a plenty, we have chicks and more eggs in the incubator, the veg patches are being planted up, the greenhouse is filling, the new greenhouse is on order, we’ve sold some birds at the poultry auction, kitchen renovations are still underway and I am trying to keep the shop side of things – online and gift shops, full of stock. On top of all that, we are having a new roof and the hung slates on the wall replaced, so major works. 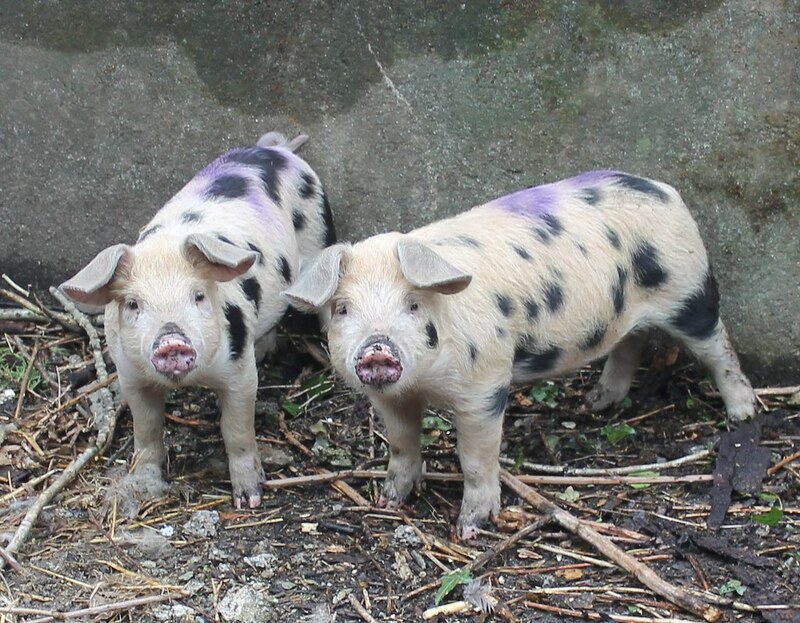 So of course we did the obvious thing and got some pigs – little spotty ones. F this year – Feziwig and Finnbar. They are Oxford Sandy and Blacks cross with Gloucester Old Spot – so a change for us as we have had Berkshires in previous years, and this time we have boys rather than gilts (last two of the litter) ,; it will be interesting to see if we feel there is a difference. They are still settling in and have had a good rummage in the mud. We believe in the ‘everything but the oink’ theory of raising and eating your own meat – out of respect to the animal really, but also because being thrifty is a massive part of being a small holder or just simply trying to grow and raise your own food. So whenever we sent a pig to slaughter we always ask for the head back. This is the bit I am the most squeamish about.. but chant under your breath ‘everything but the oink’ and proceed. In previous years we have made brawn but this time I wanted to try something different, and decided to give Bath chaps a go. 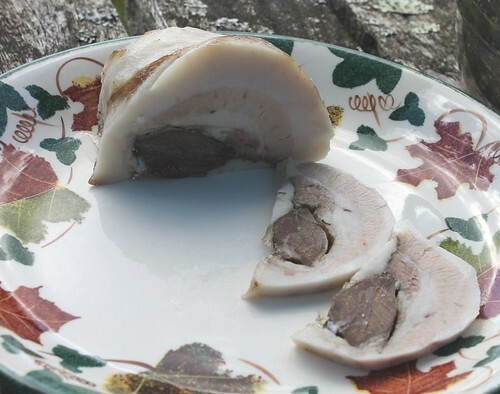 Bath chaps are a west country tradition, made popular in Bath as the name suggests, and is basically the cheeks of the pig that have been given the ham treatment. So I did a bit of reading, watched some videos, found a fair bit of difference, and took the bits I liked. You can still buy Bath chaps from independent butchers, and I guess they will each have their own version too. Here is mine. 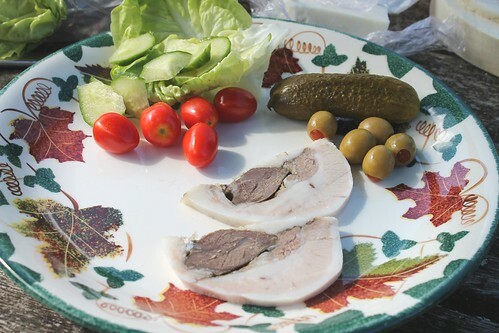 And we love it – it tastes like ham, is a bit fatty, but that tastes great too – and you can cut some off as I did (I’m not convinced it is respectful to the animal to clog up ones arteries.. however the cat had other views and nothing was wasted). A hit with the family, we ate some, froze the rest and is a real treat. Another intense week of pork processing. 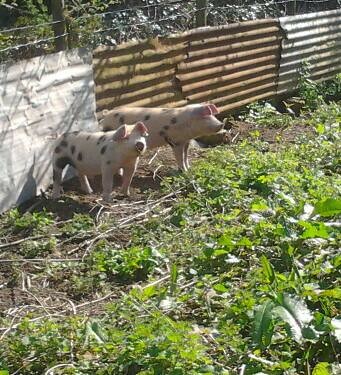 The last two pigs went off on Monday and came back as pork on Tuesday. We spent the day butchering – I know a ‘proper’ butcher would take less time but it takes us about an hour per half to butcher it to our needs – then we spent the rest of the day processing even further – the shoulders were boned out and minced into lean mince and sausagemeat. Some of that sausagemeat and offal were made into faggots and two big pork liver patés. We had liver for dinner – and still had some leftover – two pigs livers is a lot of liver and you are only supposed to eat it once a week – so we have frozen some and that will probably make more paté or meatloaf in the future. The cheeks and ears are in the brine tub in the fridge. All the joints, fillets, mince, sausagemeat, faggots, patés, trotters and bones are tucked away in the freezers – and it all, just, fitted. It is, as himself stated, the killing season. All the livestock we have been raising for the table are now beginning to make its way into the freezer, along with our vegetable and fruit harvests. It is sad in one way, but rewarding in another as the fruit of all our effort is finally seen, and it is part of settling down for winter. We took the first pig in on Monday, and collected the carcass Tuesday and this week we have been processing the meat. 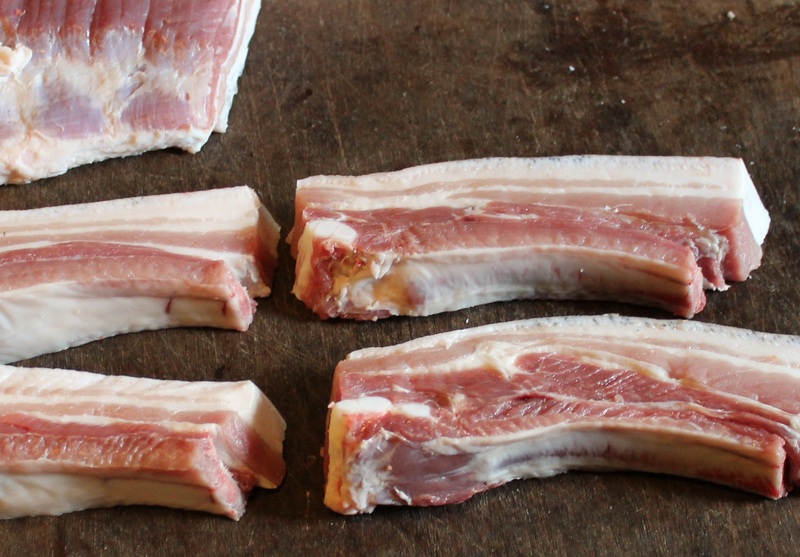 It’s been a couple of years since the last time we butchered a pig and so once again I had to bone up (sorry!) on what we normally did. We gleaned our information from the internet and books and adapted it to our needs. Last time I even took pictures and this year, I decided to make a butchery section on my webpage for future reference. We cut the usual roasting joints, boned out the shoulder, made sausage meat, minced pork, hogs pudding and using the offal: faggots – and had liver for our dinner. The cheeks and ears have been in the brine bucket in the fridge, preserving until time for the next process, and the trotters and bones have been frozen awaiting a moment to make a pork stew. And all week I have been rendering the lard, cooking up the leaf fat, separating and chilling until I have several pots of beautiful pure snowy white lard, awaiting use in treat pastry or to confit the duck legs. More to come, and it feels good, echoing many generations before us as we preserve and stash the harvest away to see us through the year ahead. On Tuesday we fetched the new weaners for this year. 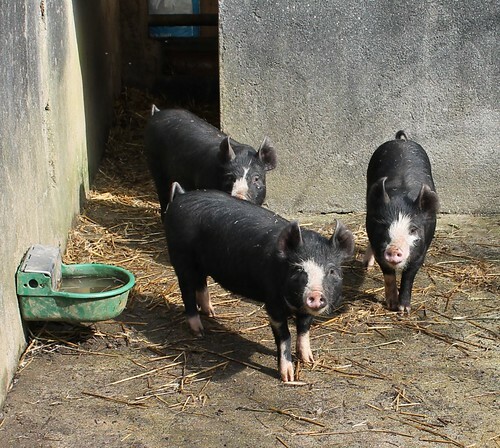 Delilah, Deirdrie and Dorothy – (we each chose a name), and settled them into the pig run. So far they have just had the hardstanding and inside to play with – ample for three little piggies, and tomorrow they will get the whole run. Which is lush and green from having a whole year to rest. It wont be lush and green for long… and they will enjoy every minute. Previous pigs have liked the set up – room to run, mud to wallow – lots of rooting ground and vegetation, hard ground to retreat to when the going is soggy, a sunny wall to sleep against on nice days, and a shady snuggly inside den. It works well for us too, as we can check on them, feed and water them without having to go in apart from cleaning out times. Hopefully these will be another three happy pigs.